Every utility tractor customer wants to maximize uptime and appreciates enhanced performance. 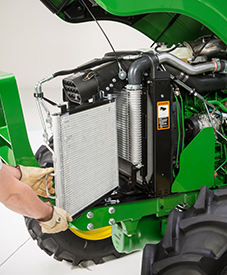 The newly designed cooling package on the Final Tier 4 (FT4) 4-cylinder 5E Tractors allows for easier access to and serviceability of certain critical components. 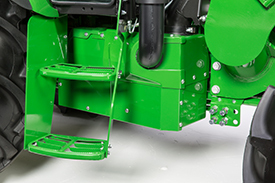 This improvement to serviceability will save time and also enhance tractor performance. 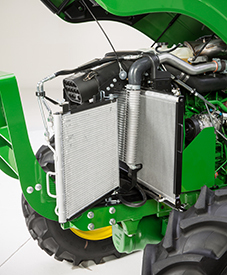 The cooling package features a first-pass screen to catch larger debris, a slide-out condenser (only on cab tractors) a charge air cooler that tilts forward, and a hydraulic oil cooler that slides out halfway to both sides of the tractor. The engine is equipped with an electronically controlled fan drive, which means that it only runs as fast as the needs of the tractor demand at that time. This is a fuel-saving device which improves hydraulic cooling and reduces the noise level for the operator. It also positively impacts total fluid efficiency. The U.S. EPA and Environment Canada requires all off-road diesel engines with 25 hp or more to meet stringent FT4 emissions regulations. 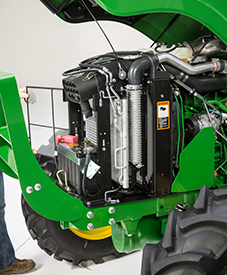 John Deere uses the most efficient and cost effective solution for the tractor package to meet emissions requirements at each horsepower level. The 5M delivers a hassle-free emissions solution that allows faster work speeds and operation with ease. The engine powering the 5E is EPA-certified Tier Level 4. This is achieved through a combination of a diesel oxidation catalyst (DOC) and a selective catalyst reduction (SCR) using diesel exhaust fluid (DEF, or urea). Several defining features on the 5E maximize the performance and reliability of the emissions package. A completely shielded DOC/SCR not only protects essential components from damage but also keeps out dirt and debris. 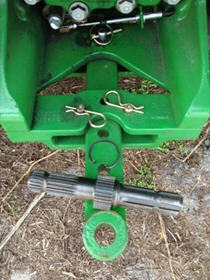 The well-packaged and tightly organized circulation system means there is more room to work around the tractor. 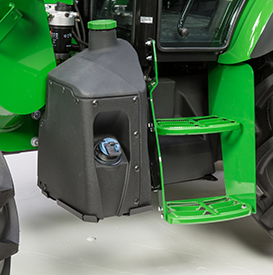 Deere has chosen to utilize an exhaust filter (DOC) to reduce particulate material so the engine can operate at a level which produces less NOx. With less NOx created, it requires less DEF to treat. The result is improved total fluid economy (diesel and DEF). The engine is programmed to aggressively respond to changes in power needs, which can temporarily increase particulate matter. Since the exhaust filter removes particulate matter instead of the engine, the engine is left free to do what it is designed to do –—delivering all of the power, torque, plus transient response needed at the exact moment needed. DEF is an ISO 22241 standard aqueous urea solution consisting of 32.5 percent urea and has a freezing point of -11 degrees Celsius (12 degrees Fahrenheit). A DEF tank keeps the customer in the field longer even when the temperatures drop below freezing. The DEF tank header is integrated with a temperature sensor and plumbed engine coolant lines are used to promote thawing and prevent freezing in the tank during operation. EGR reduces the high temperatures where these compounds are formed in the engine cylinders by replacing excess oxygen with a prescribed amount of cooled exhaust gas. Exhaust gases contain more carbon dioxide than oxygen. The EGR valve, in conjunction with the venturi tube, and ECU, allow a controlled amount of exhaust gas to enter the intake manifold to mix with the incoming fresh air. Lower combustion temperatures, creating less NOx. For added performance and efficiency, the engine passes the exhaust gases through an EGR cooler before it enters the engine. Exhaust airflow enters into the EGR cooler from the exhaust manifold near the turbocharger. Based on engine load, air temperatures, and rpm, the engine control unit (ECU) opens or closes the EGR valve, allowing a measured percentage of exhaust gas to enter the intake manifold. The gases mix with the rest of the incoming air from the turbocharger and aftercooler before entering the cylinders. 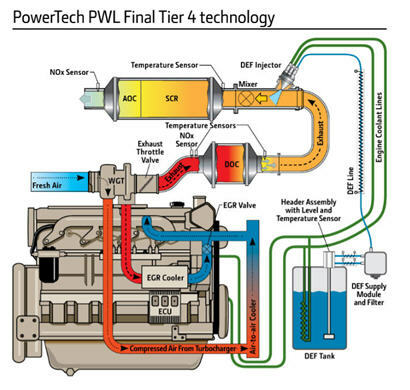 The PowerTech™ PWL 4.5L engine utilizes one turbocharger — a fixed geometry turbocharger. Fresh air is first drawn into the low-pressure fixed geometry turbocharger and compressed to a higher pressure. The compressed air is then routed to the charge air cooler and then to the intake manifold. According to engine operating conditions, the recirculated exhaust gases reduce the oxygen portion in the intake air to approximately 20 percent. Without any increase of the charge air pressure, the oxygen rate is not high enough to ensure a complete combustion of the fuel injected at high engine loads. Fuel-efficient combustion is achieved, because sufficient oxygen is provided. A restrained, cooler combustion is realized, since the typical hot combustion process, which is generated by an oxygen surplus, is dampened by the inert exhaust gases. NOx emissions are reduced. Mounted near the DEF tank, the engine control unit (ECU)-controlled supply module draws diesel exhaust fluid from the storage tank and provides a pressurized flow to the dosing module. When the ignition key is off, the supply module pump will reverse direction to return any accumulated fluid back to the tank. The supply module is also fitted with a replaceable filter to prevent contaminants from entering the dosing lines. Both the supply module and dosing lines are electrically heated and controlled by the ECU to determine when diesel exhaust fluid dosing can begin. The dosing module is cooled by engine coolant and used to inject DEF at a pressure of 130 psi (900 kPa, 9 bar) into the decomposition tube. A harness is connected to the dosing valve that relays the needed DEF to inject based upon the amount of NOx exiting the DOC measured from the NOx tube sensor. The decomposition tube is the internal mixing device used to circulate DEF with engine exhaust prior to entering the SCR/AOC after-treatment device. To reduce the NOx, DEF, or urea, is injected into the exhaust stream. When the exhaust gases combine with the DEF in the SCR catalyst, the NOx is broken down into nitrogen and water vapor. Getting the power to the ground refers to torque. 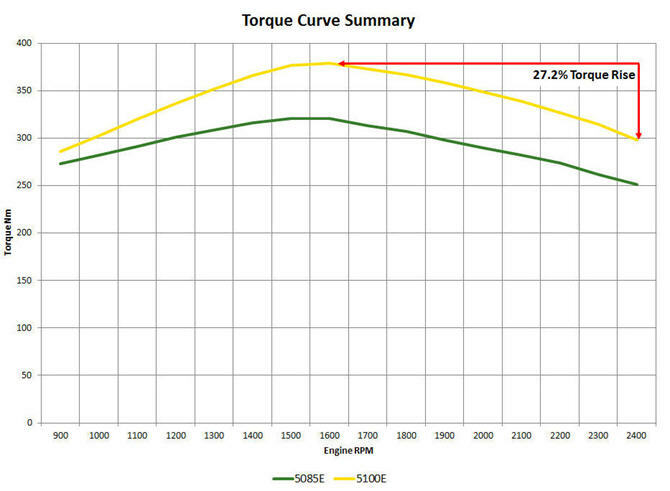 Torque is a force that produces or tends to produce rotation or a twisting force. Torque represents the useable power that can be achieved. The more torque, the more lugging ability is available. More torque also equates to more load carrying capacity. An instrument cluster provides more information in a cleaner more vibrant display. The roll-mode function now has the ability to show more diagnostic codes to keep the operator informed about the tractor’s functionality. 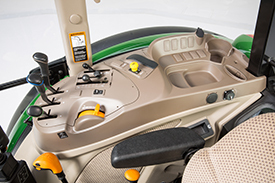 This window into tractor functionality and diagnostics provides ample information. Indicators, warning lights, and even the gauges are clear and bright. The roll-mode function now provides operators with crucial onboard diagnostics. Engine hours, power take-off (PTO) speed, ground speed, hi-lo indicator, forward, neutral, and reverse, are all visible at the same time. There is a light out indicator for trailer light, turn light, and hazard light bulbs which is driven by updated software. It is a straightforward layout and sleek design with no customer interface required. When operating the PTO, there are clearly presented PTO target bars to indicate the correct PTO speed. There are daytime and nighttime modes which are based on the position of the light switch. The mode actually adjusts the backlight levels of the display for optimum visibility. Customer needs drive us to deliver distinctive value in our solutions. The applications in which John Deere utility tractors, implements and attachments are used are growing by the day. A 540/1000 PTO rpm field-installed kit is available for the 5E Tractors. With this kit installed, operators can switch between standard 540 or 1000 PTO rpm based on the requirements of the implement. From rotary cutting, to shredding to snow throwing and baling, the capability to operate an implement requiring 1000 rear PTO rpm is available. Once installation is complete, this solution offers the convenience of switching between 540 and 1000 PTO rpm with relative ease. Combined with the dry sump design, this attachment includes a reversible shaft. This provides for a less mess, no stress option that will enhance customer productivity and increase uptime. This PowrReverser transmission provides 24 forward speeds and 12 reverse (24F/12R) speeds. This transmission comes standard with a dual speed 540/540 Economy power take-off (PTO), and is ideal for applications requiring frequent directional changes, such as loader work and PTO work like rotary cutting and baling hay. Two platform-mounted levers offer easy and comfortable shifting. To distinguish the two levers for ease of operation, the gear-shift lever is longer and the less-used range lever is shorter. Unique knobs make it easy to distinguish between the two just by feel. The hi/lo selector buttons are located on the gear shift lever for each forward gear, and are represented by a rabbit and a turtle respectively. The forward lever selects one of four gears. All are synchronized for on-the-go shifting with the use of the clutch. The rear lever selects one of three ranges: A, B, or C.
Maximum productivity is achieved with clutch-less hydraulic shifting between forward and reverse. PowrReverser functionality is ideal for rear blading and any applications that require frequent directional changes in tight spaces. An electrohydraulic fingertip directional lever control allows the operator to effortlessly switch directions with a small finger motion. The control is located on the left side of the instrument console and selects forward, reverse, and neutral positions. 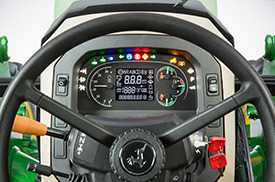 It also allows the operator to steer and shift direction with the left hand, freeing the right hand to operate other tractor controls, such as the loader, rear implements, or hand throttle. The PowrReverser has a built-in engagement override valve for additional safety. This valve requires the clutch pedal to be depressed one time after each engine start before the transmission will begin to operate normally, giving the operator another opportunity to put all focus on the tractor. A neutral start switch requires the directional lever be in the neutral position to start the engine. The speed of directional changes can be adjusted to the operator's preference or application demands with an optional field installed infinitely variable control kit. 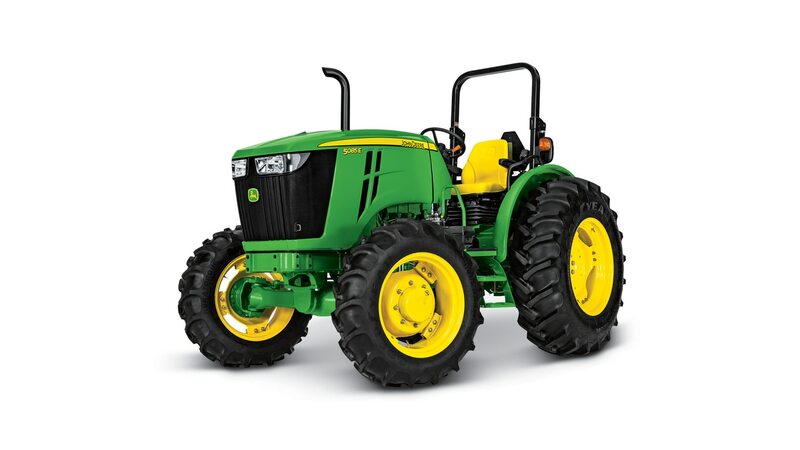 All tractors have economy PTO (E-PTO), a fuel-saving feature which allows customers to operate rear implements at 540 PTO rpm but at lower engine rpm. The result is lower engine vibration, reduced noise, less wear and tear on the engine, reduced fuel consumption and increased operator comfort. See PTO Functional area for more information on E-PTO.